...and every one of their insanity laced ideas can be gotten around, but yes, it takes effort. The LDS Church is ending its relationship with the Boy Scouts of America. A year ago, the church was the BSA's largest faith-based chartering organization and Mormon boys comprised 1 in 6 American Scouts. It’s a shame what they have become. Have fond memories of the Boy Scouts in the early ‘60s in West Texas and Buffalo Trail Scout Ranch. The BSA walked away from their principles, so churches and families walked away from them. Ding, Ding, Ding. As an Eagle Scout, my kids will not be participating in Boy Scouts. I will do what I can to instill similar values through similar activities or another organization. Unfortunately, there isn't another organization out there that (literally) had over a century of experience and resources- all flushed down the drain for political correctness. 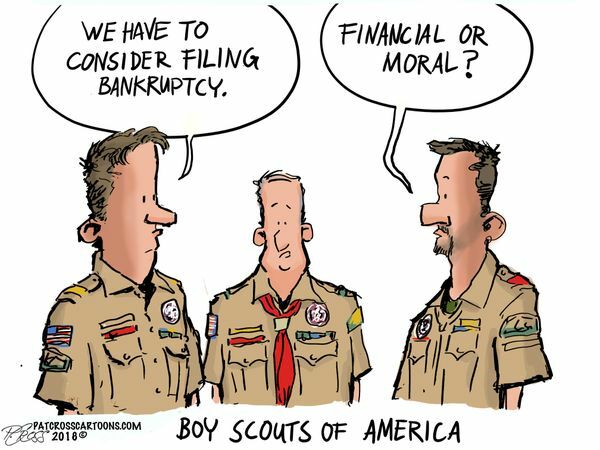 The Boy Scouts had to start somewhere. Yes, but it will be a solid two or three generations before another org can grow up into a void that large. What I lament is the loss to my kids, but with friends still in Scouting and hearing how things are going now we won't be taking part. They have 25,000 members, 800 Troops in all 50 States. Seems like all our cherished institutions are adopting the Alynskyite social justice playbook. There is no escape. I am proud they seem to filling the Gap! Scouts asked to recite pledge of allegiance at city council meeting, one boy took a knee. Praised by Mayor, feature article at WaPo. Yeah it’s over, just kinda waiting to see if AOC takes control before she is 35 or after.